Zombie Girl has made good. Emily Hagins was 12 years old when she directed her first feature film, Pathogen, the production of which is documented in the delightful documentary Zombie Girl: The Movie. I still haven't seen Pathogen, but I love Zombie Girl, a movie about a passionate born filmmaker, the relationship between a mother and daughter and just how hard it is to make a movie, no matter the scale, budget or age of the director. But I have to wonder if the documentary put Hagins in a box; sure, she's still one of the treasures of Austin (one of the only cities in the world that could produce someone this special), but does her public back story hinder her from being taken seriously? Even watching her previous movie, 2011's My Sucky Teen Romance, I felt like I was grading on a curve. I enjoyed the movie for its earnestness and for what Hagins was clearly trying to do, but I was still cutting her slack -- in my mind, she was still the "kid director." With her latest film, Grow Up, Tony Phillips, Hagins is no longer boxed in by her backstory. This isn't the work of a precocious young girl who shows some talent for directing; this is the work of a real filmmaker with her own original voice. It's a sweet, gentle, funny movie about following through on the things you love even when other people don't understand those things. There's little doubt that Hagins drew upon her own experiences in writing the screenplay -- unless, of course, she has been surrounded her whole life by people who totally understood and accepted that a 12-year old girl wanted to make zombie movies. Of course in Austin, she probably was. Hagins regular Tony Vespe takes center stage at Tony Phillips, high school senior and general outcast who's looked down upon for how seriously he still takes Halloween. He enters costume contests. He still goes trick-or-treating. His closest friends Craig (Devin Bonee) and Elle (Katie Folger) try to talk him out of it. His mom wants him to focus on his college applications. The only people in Tony's life who support his passions are Mikey (Caleb Barwick), the 10-year old for whom he babysits, and Pete (AJ Bowen), his visiting cousin who's having some money troubles. That last subplot with Bowen feels a little tacked-on; it's the only part of the movie that feels plot-driven instead of character-driven, and the shifts can be jarring. It's inclusion is just a way of giving another character the opportunity to disappoint Tony. It hardly matters, though, because Bowen's scenes are so much fun; he and Vespe have an easy chemistry that hints at years of back story and inside jokes without it being explicitly stated time and again. To call Grow Up, Tony Phillips a "coming of age" movie is a little reductive, even though it is a movie about young people learning about the world. Hagins subverts that formula by making Tony an unchanging figure of integrity; it's not a film about Tony "growing up," but rather a film about everyone around him coming to understand what makes him special. That doesn't mean that Tony is without flaws; he can be stubborn and prickly and not always easy to be friends with -- you know, the way real people can be. While he may not go on to a huge mainstream career, Vespe -- a close friend of Hagins for whom she wrote the part -- is very good in the title role. He's natural and believable, projecting intelligence and eccentricity without appearing to "act." That makes sense, because Hagins has said she deliberately wanted to write a movie that would let people see "Tony being Tony." The performances across the board are the best yet for a Hagins movie; AJ Bowen lends credibility, but even the lesser-known actors are very good. The real find of the film is Katie Folger as the female lead (she's also in the upcoming Zero Charisma, a movie that just blew the doors off at SXSW). She's adorable and big-hearted, like a young Elizabeth Shue. There are so few good Halloween movies, and Tony Phillips gets the holiday right -- the color of the sky, the look of the leaves, the temperature in the air. It's all the more impressive because there is no fall season in Austin where the movie was shot. This is a movie that's set on Halloween more than it is about Halloween, but the care that Hagins and her crew show in getting the details right speaks to the passion everyone involved has for the project -- they care about filmmaking the way Tony cares about Halloween. The movie's indie-pop soundtrack is great, too; rather than being cobbled together by a music supervisor or marketing department, Hagins hand-picked music from her friend Santiago Dietche, and it works almost like another character in the movie. It's hard to talk about just how much growth Hagins has shown as a filmmaker without unintentionally disrespecting her previous films, but Grow Up, Tony Phillips really does represent a monumental leap. Those early movies are great for how they represent who Hagins was when they were made, and for showing that she is a born filmmaker determined to tell stories by any means necessary. There are no zombies or vampires this time around, and it turns out that Hagins is at her best when just dealing with people. The movie is well observed, and showcases a young filmmaker with a voice. At a time when so many young artists are mostly interested in imitating the things they like, it's great to see that Hagins has something original to say. 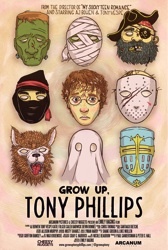 I smiled the whole way through Grow Up, Tony Phillips. It's a sweet movie, one that's genuinely interested in the thoughts and feelings of young people. We see so many films in which teenagers are depicted as party planners or date rapists (Project X features both!) that it's refreshing to see one so willing to listen to them and take them seriously. Hagins said during the post-screening Q&A that she hopes to continue to make authentic movies about young people -- ones which reflect the world as she sees it. I'm on board for that. Here's hoping Emily Hagins never grows up. Grow Up, Tony Phillips screened as part of the opening night of the first-ever Chicago Film Critics Film Festival, a three-day festival dedicated the memory of Roger Ebert. I attended all three days and plan to write up every one of the movies I saw, because people need to seek these out when they can. It was a great festival, showed a bunch of great, smaller movies and I really hope it becomes a Chicago tradition. Look for more reviews throughout the week. Based on what I've read here, I really want to see this movie. Just seeing the picture of the pumpkins reminds me how much I love Halloween and fall, and your enthusiasm is infectious. This sounds great.